Using some Perry British Light Dragoons, painted up a unit of Spanish Dragoons as they might've looked after being supplied by the British. 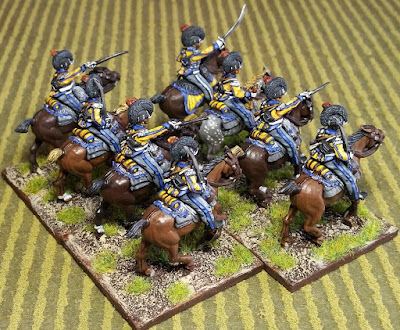 In the Albion Triumphant Peninsular supplement to Black Powder, Spanish cavalry are not rated very well. However, I intend to have them with the same stats as their British counterparts. Love the look of the deadly Pattern 1796 Light Cavalry Saber. It was adopted by the Prussians, as well as the Spanish and Portuguese.. 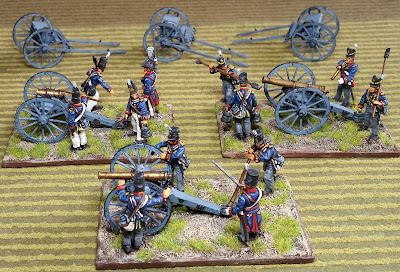 These guys will be used in a few weeks at a game day held at historic Fort Steilacoom. It'll be mainly a rules refresher game for me. 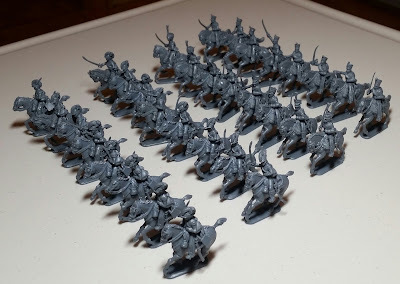 The tables being only 5x6 feet, I plan to reduce cavalry units to four figures. 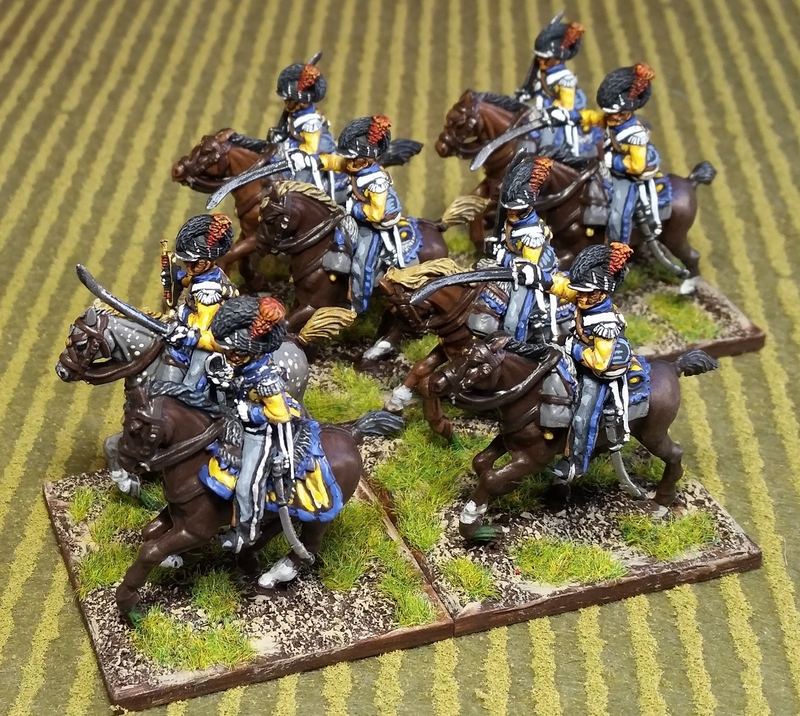 Here's an image of Spanish Dragoons; the one on the far right being the inspiration for this unit. 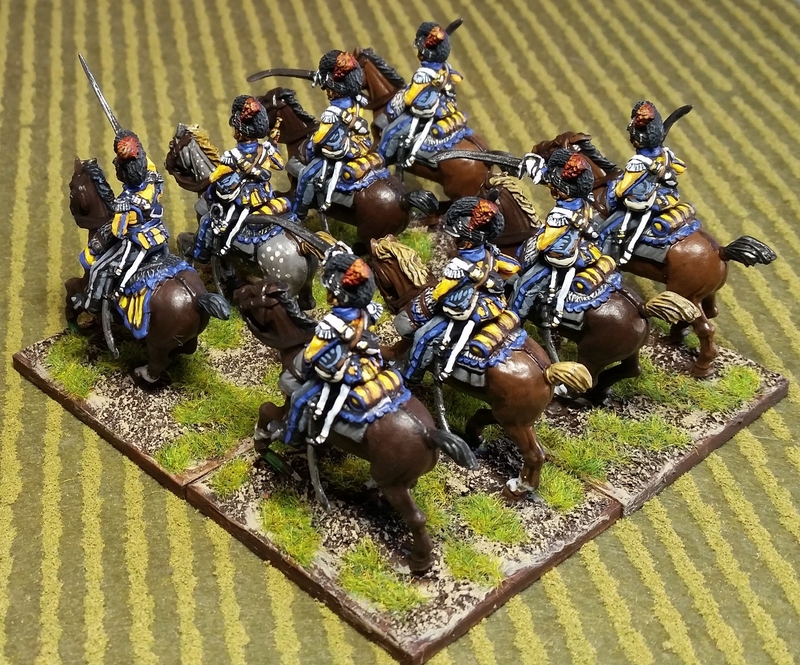 Next up will be some French Chasseur a Cheval. Thanks for stopping by and best to you all. Just applied Minwax Tudor Satin stain to 32 horses which will be the mounts for two units of French Chasseurs a Cheval, and a unit each of British Light Dragoons and Spanish Dragoons. They will be in units of 8 figures each. 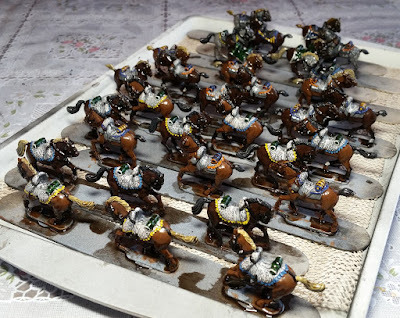 Most of the horses were painted with inexpensive craft paints - Ceramcoat Burnt Umber and Apple Barrel Nutmeg Brown. The greys were painted with a mixture of Vallejo White and Americana Lamp Black - just what I had available at the time. Here's what they looked like prior to the staining with the block paint job - and some highlighting. Once the stain is dried completely - hopefully by tomorrow afternoon - they'll be Dullcote'd and touched up as needed. Then the riders will be started. Thanks for dropping by and best wishes to you all. Here are the "Canaries" on parade and on maneuvers - possibly in the Peninsula or maybe in Russia. As mentioned in the previous WIP post, these are all Perry figures from their separately sold command sprue. There is a lone Victrix figure in the rear of the skirmishing Voltigeurs stand. 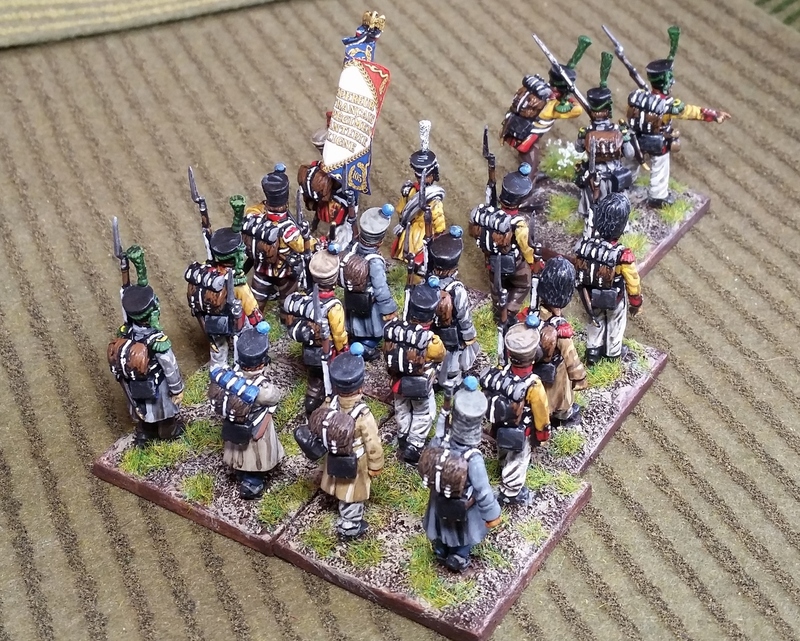 4 earlier painted figures in greatcoats were also added to plus up this unit to 16-figures (not counting the skirmishers). 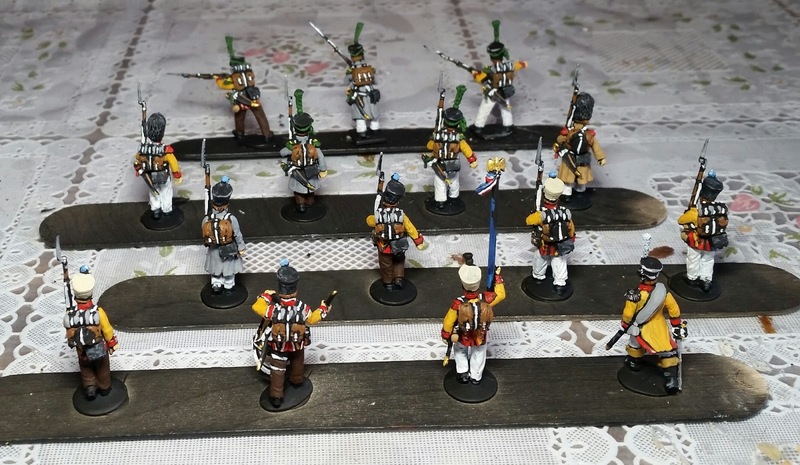 The bearskins on the Grenadiers are from the Victrix Middle Guard set; the Voltigeur heads are from the Perry Chasseur a Cheval kit. 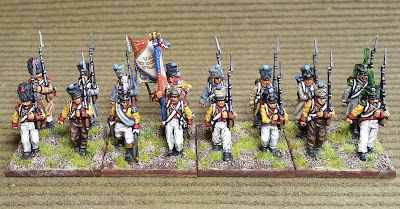 I wanted the front ranks to be without greatcoats to easily identify them as Neuchateliers. 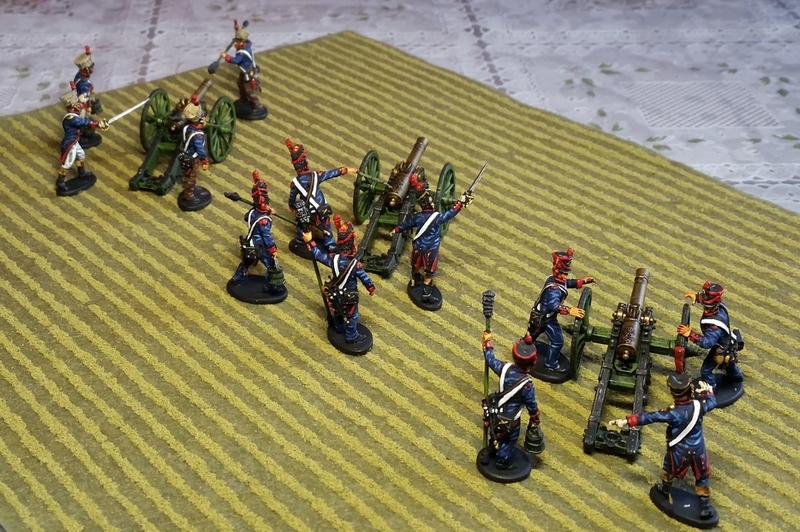 In the image above, they are in Mixed Order, Attack Column with skirmishers out front. March Column with skirmishers in the lead. 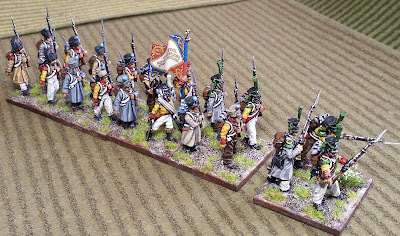 There are now enough foot units for a 6-player Black Powder game - with 16-figure Regular sized units, that is; 9 French and 8 British units, not counting skirmishers and British Rifles. For the record, they can also be reconfigured into 24 and 32-man units as well. 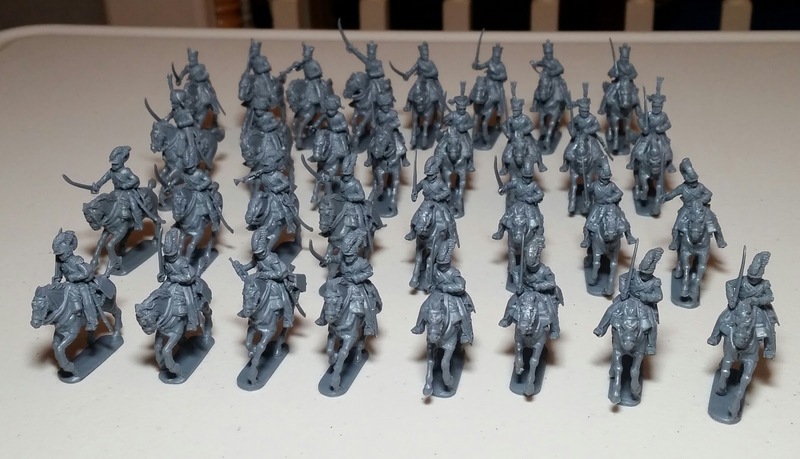 Next up are the Perry plastic British Light Dragoons and French Chasseur a Cheval kits. Thanks for stopping by and best wishes to you all. 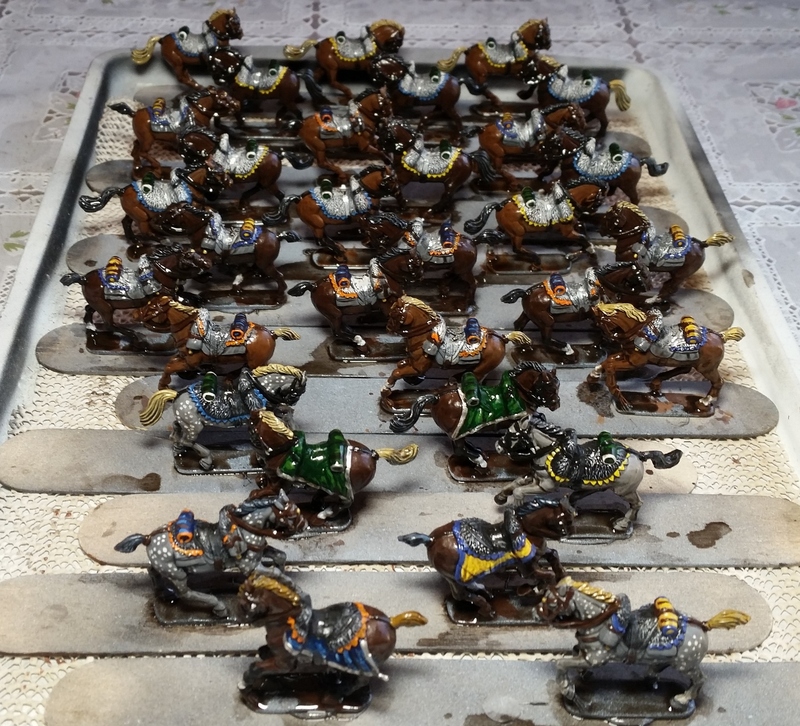 Pulled a marathon paint job today - about five hours non-stop. 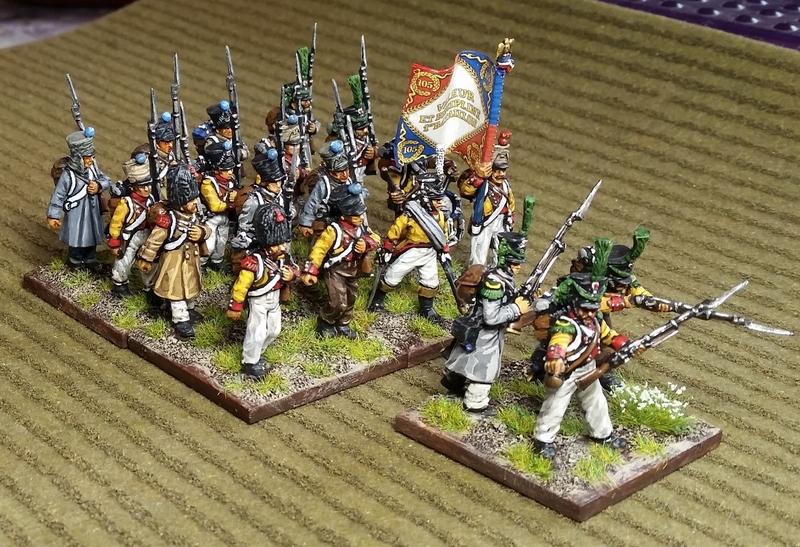 Started in the early afternoon, after I mowed the backyard, and just finished the basic blocking of some Perry French plastics as Neuchatel Battalion. They'll get a Minwax stain tomorrow. 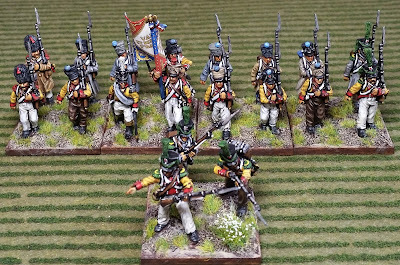 The eye-catching uniform, as well as a good combat reputation, makes this unit a favorite of most Napoleonic gamers; myself included. 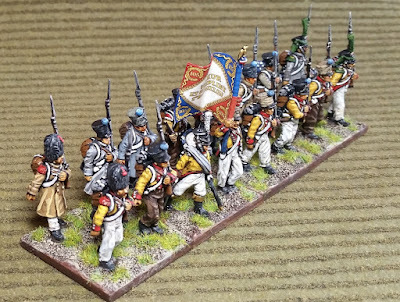 The center voltigeur in the last row wearing a greatcoat is a spare Victrix figure from the Middle Guard kit. The rest are Perry plastics from a command sprue. 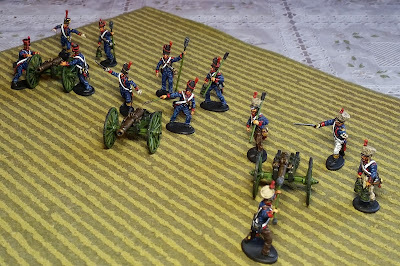 The bearskin heads and plumed shakos of the voltigeurs are also Victrix spares. I used a black undercoat as I wanted to use the black-lining technique which speeds up the process a bit. Once these guys are done, I'll finally get back to the cavalry sets which are already glued together - the British Light Dragoons and Chasseur a Cheval sets. Greetings all. 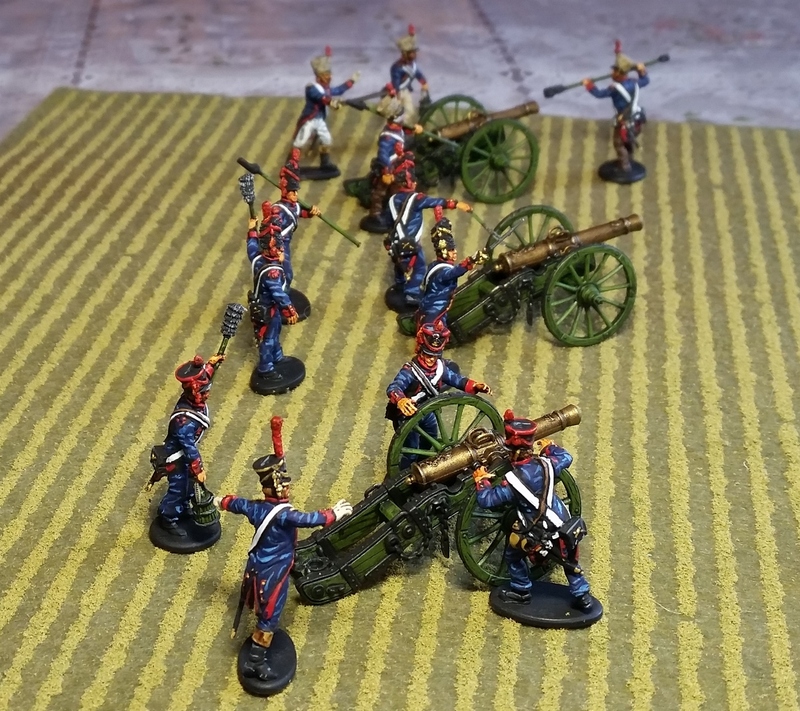 Just finished up the Victrix British Artillery set. 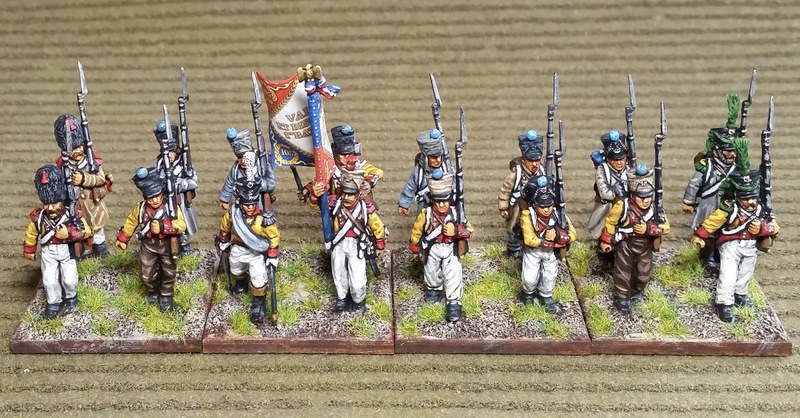 Still need to base the limbers, but the main pieces are done. From left to right: 5.5 inch Howitzer, 6 Pounder and 9 Pounder. Apparently, the 9 Pounder wasn't in use in the Peninsular. The crew for this gun is in the post 1812 uniform with "Belgic" shako. 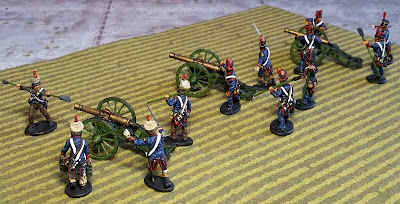 The bases are 85x55mm, so the crew fit around the guns quite snugly. I wanted them to have minimal fooprints for gaming. 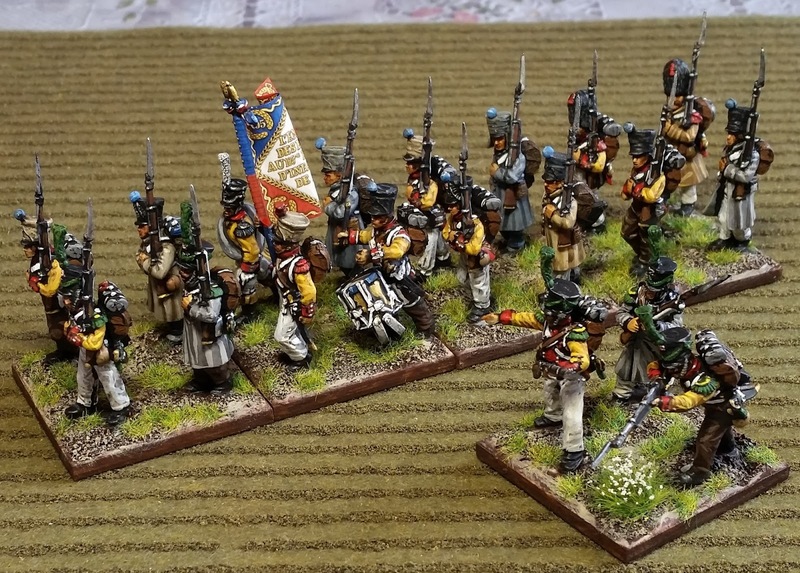 The French batteries are now also on 85x55mm bases. I may get a French Horse Artillery battery later. The British already have a couple of RHA. Still have the British Light Dragoons and French Chasseurs a Cheval to work on - but I may start on a set of Perry French foot first. Thank you very much for visiting, and wishing you all the best! Well, actually still need to get them based, but the painting is done. These are from the 1804-1812 set with the earlier style uniforms. 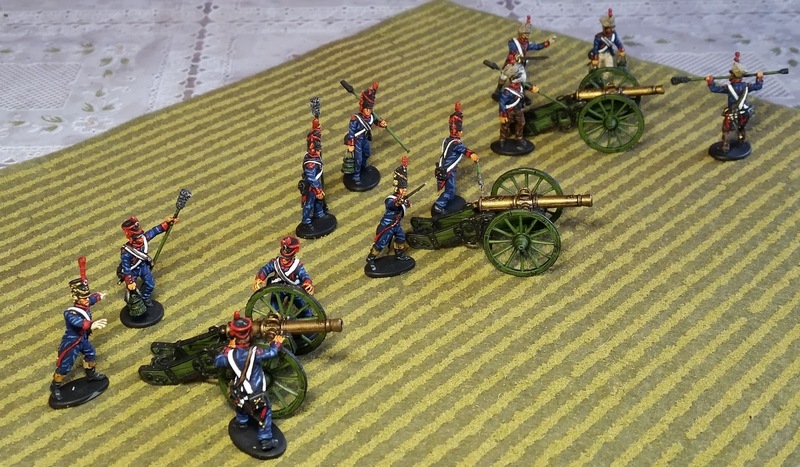 The center battery has a 12 pounder manned by Guardsmen. 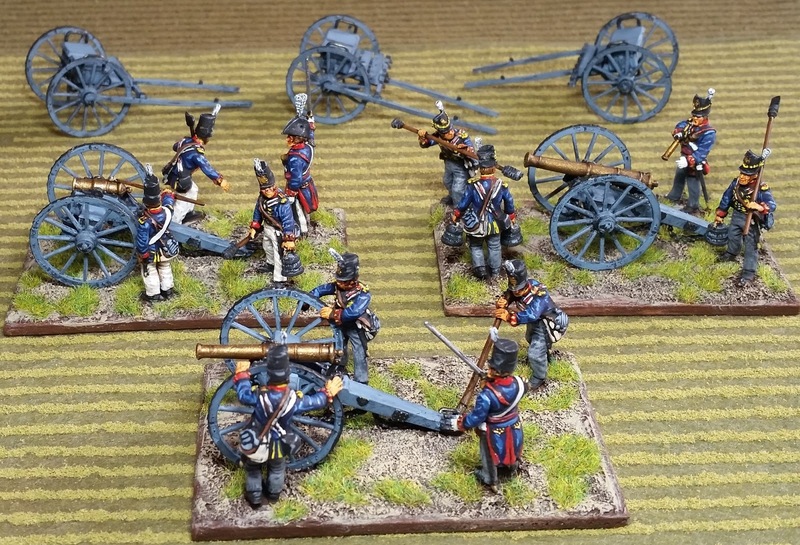 The other two are Line artillery with 8 pounders. 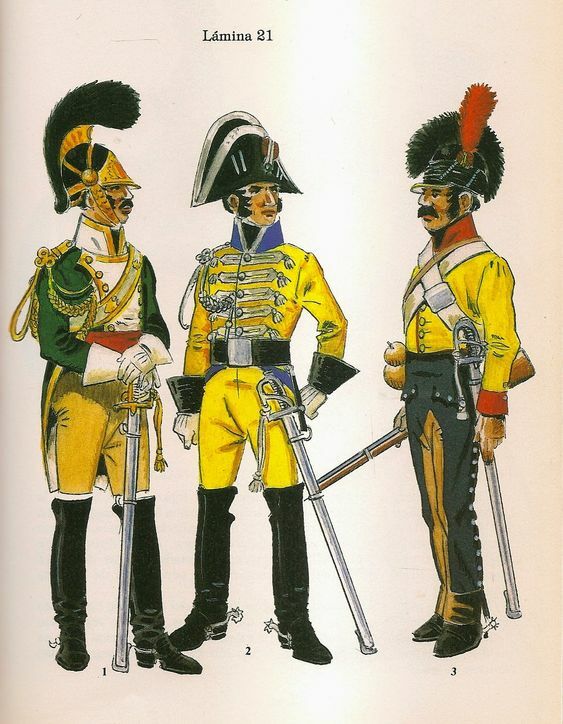 The battery on the left are in campaign dress and the other two in full dress - less full gaiters. This is a great plastic kit which goes together quite easily. The guns have far less parts than the British set. Grab handles and chains are molded onto the main pieces, unlike the British set. 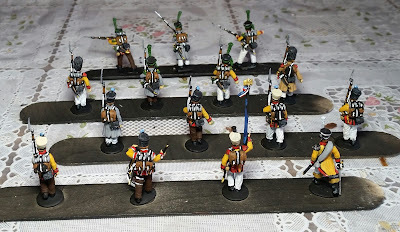 As mentioned in a previous post, the set comes with enough figures for 5 crewmen per gun, but I opted to use only 4 figures so the bases won't be too large. 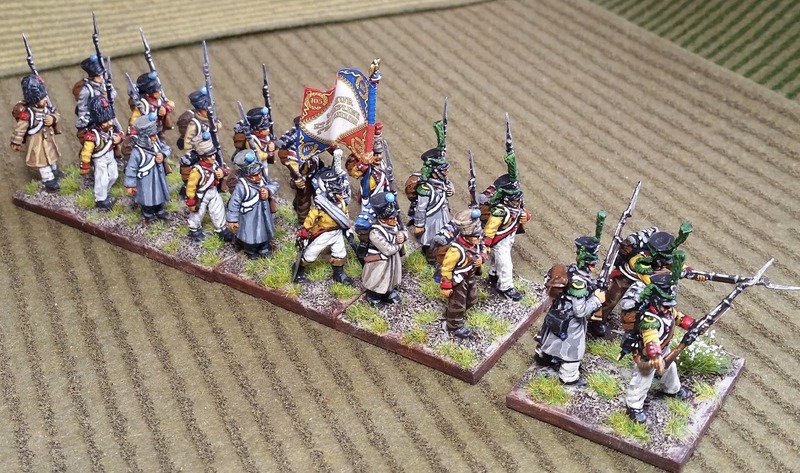 The heads with covered shakos are from the Middle Guard set. They seemed a bit nicer than the ones in the artillery set. With the various separate pieces, there are many options for poses. 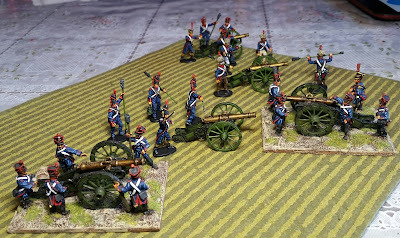 I used Vallejo Game Color Goblin Green for the gun carriages - seemed to look okay after an ink wash. 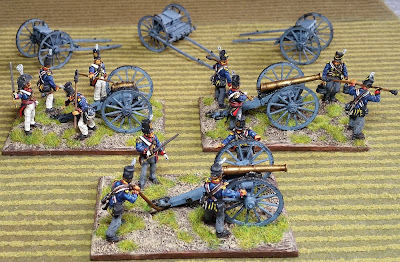 Here's a comparison shot of the Victrix batteries along with a couple of Sash and Saber 12 pounders. 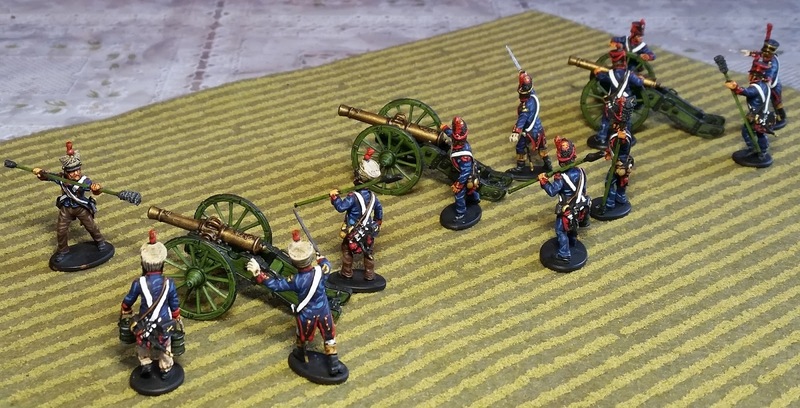 The gun tube itself is almost exactly the same size as the Victrix 12 pounder, but the carriages and wheels are massive compared to the Victrix ones. 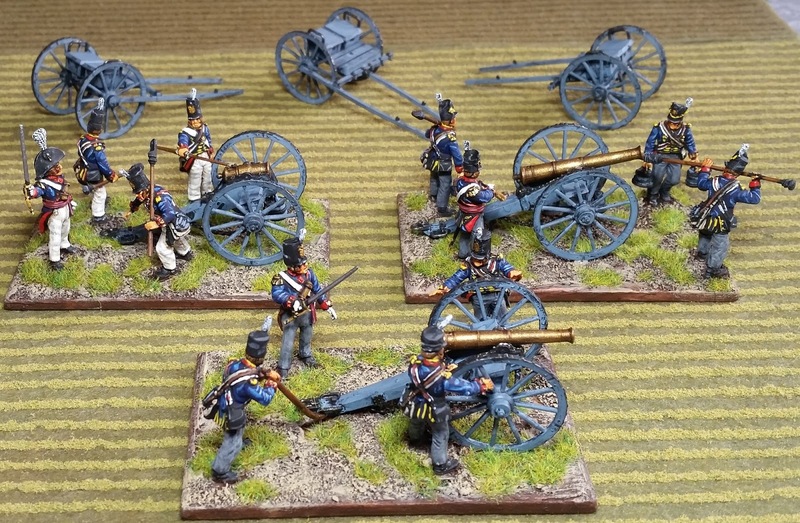 Next up are the British batteries. Thanks again for stopping by, and best wishes to you all. No painting, just a bit of snipping and gluing together of plastic parts of Perry French Chasseurs a Cheval and British Light Dragoons. 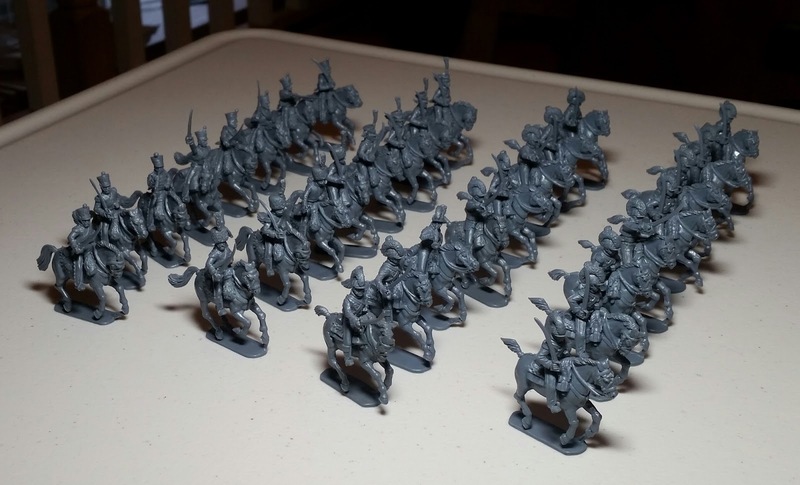 A command sprue of each are also added to complete four units of 8-figures each. These are quite exquisitely detailed and sculpted sets, and very easy to assemble. 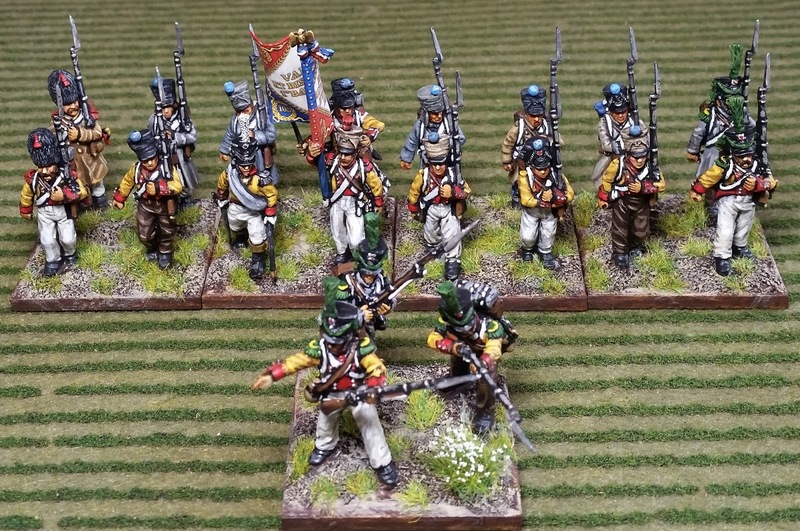 One unit of chasseurs are in full dress, while the other one in more campaign dress. 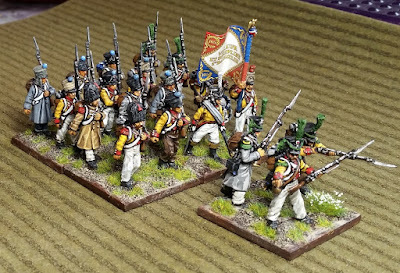 They'll be painted up in two different regimental colors. 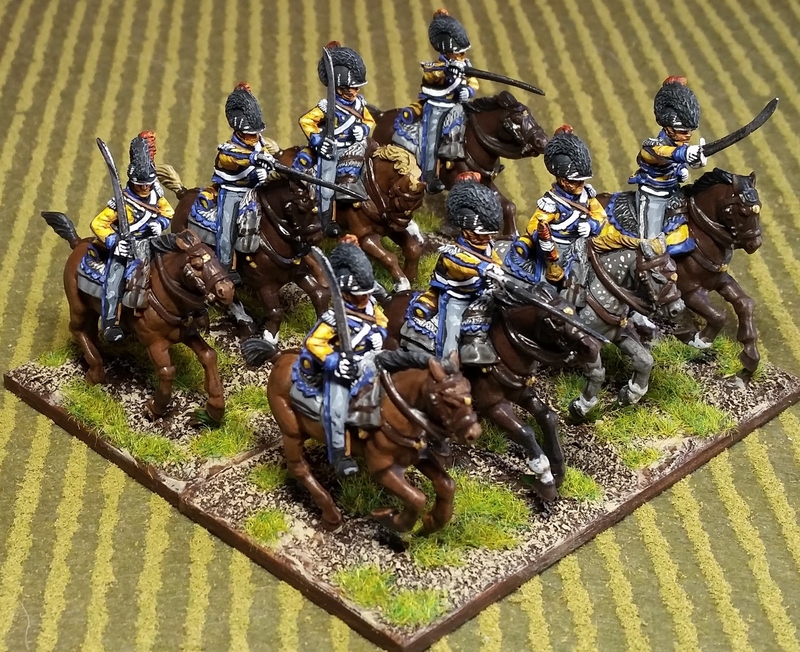 Both units of British light dragoons are wearing the Tarleton helmets. However, one unit is in the earlier braided dolman and the other in the 1812 Polish style jacket. 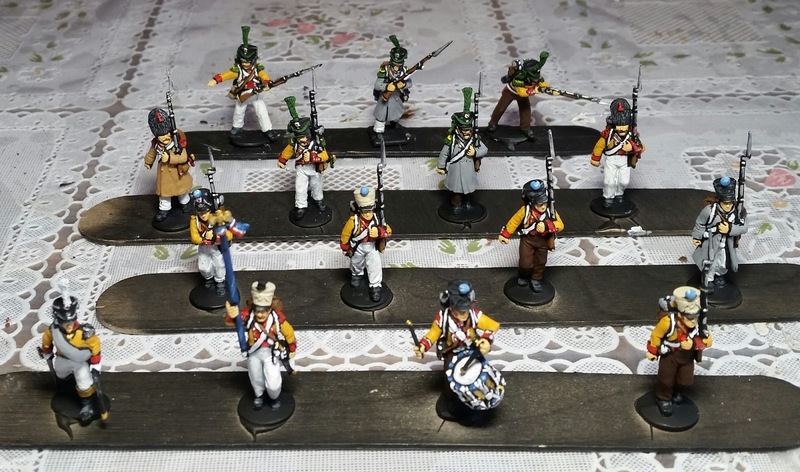 They will also be representing two different regiments. Although there are now more than enough cavalry units for the games I intend to host, I still would like a lancer unit. 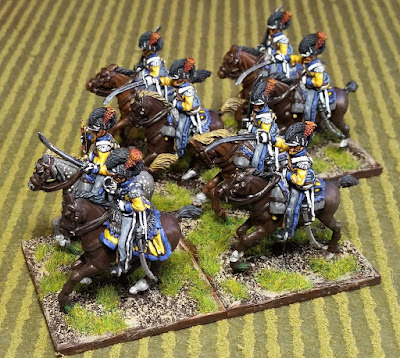 I may get a box of the Warlord Games Polish Lancers, but the horses aren't as nice as these Perry ones. 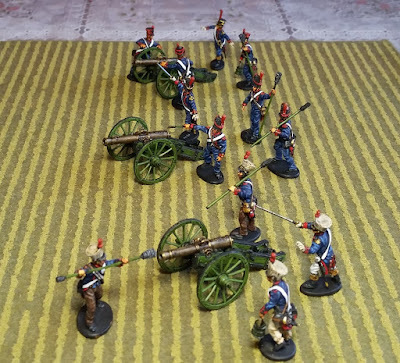 Well, thanks for stopping by and I do need to back to the Victrix artillery sets.